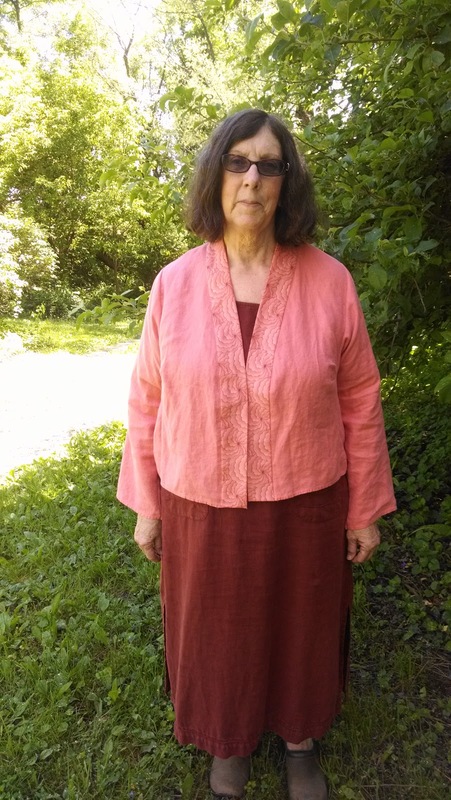 I finished my May garment in time to model it at my ASG meeting on Tues. night, but my photographer friend was sitting so close to me that the picture she took of my jacket didn't look all that great so I had to get my husband to photograph me this morning and here's one shot of my Tabula Rasa jacket made from an peach linen tablecloth I bought for $2 at a church rummage sale. There are some indoor photos which show my jacket from all angles on my blog http://suzyssewingsite.blogspot.com as well as a more detailed description of what I went through to make it! Can't wait to hear what the June topic is going to be, since this challenge has gotten me to finish a lot more garments than I would have if left to my own devices! Wearable Muslims are great rant they. Love the detail on the neck band. Like you I find the monthly challenges help with choosing what to make and focus me on finishing.